"LOUIS NAGEL is a pianist with whom I have enjoyed collaborating in Berlin, Budapest and Ann Arbor during the past twenty years. His rare insights, coupled with his total command of the keyboard both technically as well as interpretively make him a conductor’s dream soloist. He is immensely respected by his peers a pedagog and a scholar; his ceaseless energy dedication and respect for the history and present state of the piano world place him among the current giants of the keyboard." "Mr. Nagel's interpretation of the Bach shows not only his command or the piano but his constant searching for the expressive possibilities of this music. His abilities as a pedagogue, as a performer, and as a scholar are all synthesized to produce a very convincing result." "Hurrah for Louis Nagel who brings to this CD not only a harvest of refreshing repertoire, but an exciting musical intelligence combined with a brilliant technique." "The practice by the Conservatorium of playing host to artists-in-residence, who earn their supper for a few weeks by injecting new ideas and methods into music teaching, is paying handsome dividends in the public performance arena. 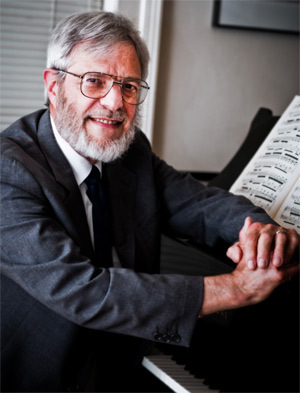 The latest such visitor is Louis Nagel, an American whose career has taken him from Juilliard to the piano faculty of the University of Michigan School of Music. His twilight recital on Thursday impressed from beginning to end. He did not trifle with four short Mozart pieces- Adagio K540, Minuet K355, Gigue K574, Rondo K485-but treated each as part of something larger, perhaps cadenzas in a concerto. Then came a dramatic but well-controlled Les Adieux sonata by Beethoven, with even the shortest note in the vivacissimamente movement, and there are a lot of these, distinct and clear. Some pianists play Pictures From An Exhibition as if it were an orchestral score by Ravel of which Mussorgsky made a piano reduction. But Louis Nagel stressed its musical, rather than spectacular side with a fine balance of romantic contrast and a technique that only once, near the end of a fine recital, departed from the immaculate." Town Hall Concert: "The performance of Pictures at an Exhibition was his best of the evening ... the changes of mood and color were vivid, and all fit into an astutely organized conception of the work as a whole. The scale of relationships between delicate passages and those of big, rich sonority was always kept in balance, and the composition emerged as a deeply satisfying panorama of contrasting aural experiences." "A smashing performance of the Liszt B Minor by Louis Nagel will not soon be forgotten." "Nagel . . . is a very assured pianist who seems to have polished off his gift to a high degree of artistry In the perfection of this approach to Bach's music, he reminded one strongly of Glenn Gould. The presentation was flawless . . . For his encore, Nagel decided to do a thing which is fairly common among organists but almost never done today by pianists- improvise. He picked out a simple theme on the middle octave of the piano, and turned it into an excellent etude for the left hand only. It was a fascinating performance." "Nagel proved to have uncommonly arresting ideas, with a commanding way of projecting them. Brahms is a composer especially close to him, and both the sonata and the variations had a musical vigor that made them startlingly effective." "Getting acquainted with the Michigan Pianist Luis Nagel this Wednesday evening the The Hague's Diligentia Hall was a most refreshing experience." "Impressive throughout the [all-Bach] recital was Nagel's control and the care with which he planned his program."